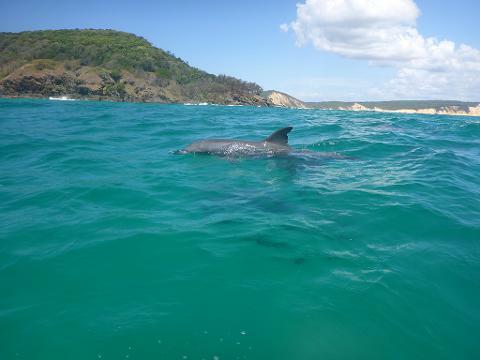 Experience an Epic Ocean Adventure back to nature and into the wild with our Noosa Dolphin View Kayak Tour. Feel the thrill of a stunning 4X4 adventure along the spectacular Teewah Beach from Noosa’s North Shore, deep into the Great Sandy National Park to a pristine ocean kayaking location, Double Island Point. 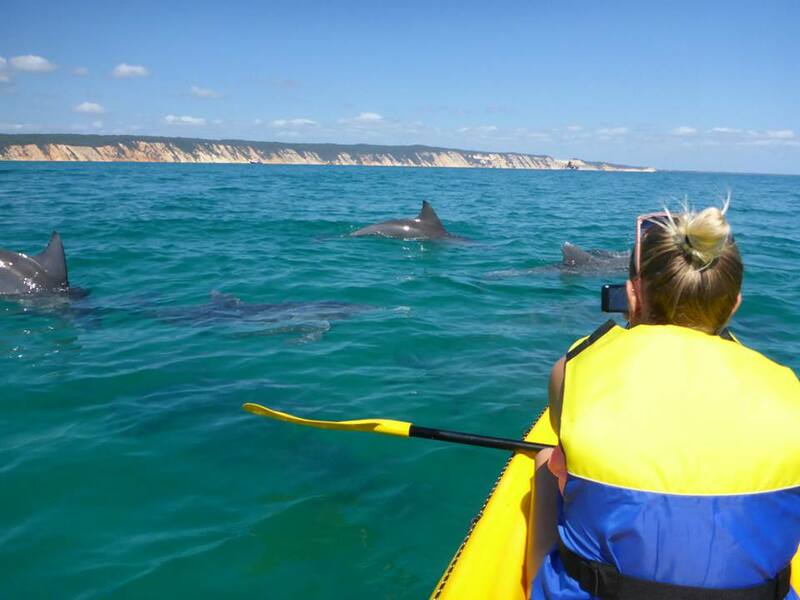 Immerse yourself in the views and natural beauty of Australia’s Nature Coast on a guided kayak tour whilst experiencing a buzzing hub of wildlife including Bottlenose dolphins, Humpback whales, turtles, rays and more in this tropical aquatic paradise. 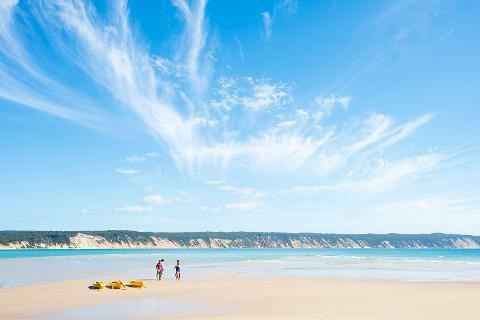 This location features scenic views of the Rainbow Beach coloured sand cliffs, Fraser Island and pristine Honeymoon Bay. Large Bottlenose dolphin pods, Humpback whales (June – November), Six of the world’s seven marine turtle species can be found here as well as manta rays, sting rays, soldier crabs in their thousands and a variety of spectacular local and migrating bird species including the Brahminy and Whistling Kite, Eastern Osprey and many others. 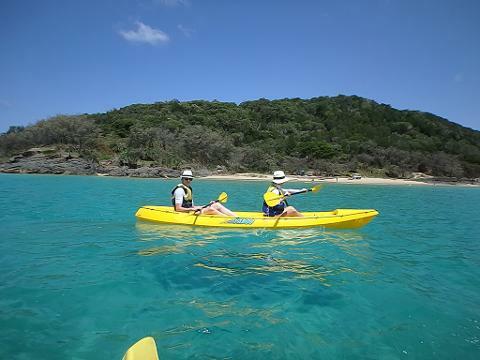 We guide you on a gentle kayak tour in the tropical waters of Honeymoon Bay and Double Island Point headland taking in the breath taking views and natural surroundings of the area as well as seeing the Double Island Point Lighthouse from a unique view. Bottlenose dolphin pods are often seen here enjoying the Marine Park and feeding on large schools of fish and to see them living in their own habitat is a truly rewarding wildlife kayak experience. 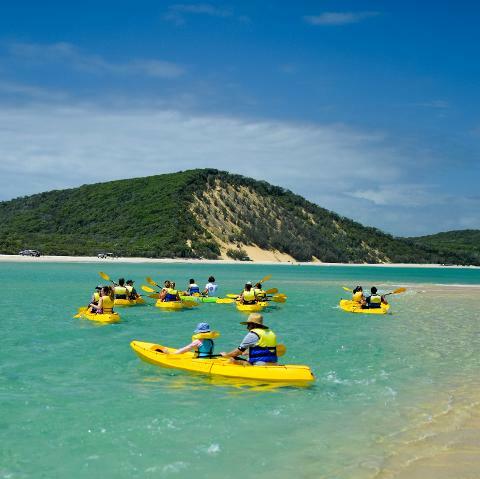 No experience is required for this Noosa kayak tour, beginner friendly location & suitable for all levels. Experience a unique National Park kayak adventure > 4WD vehicle access only. Casual guided paddle around the spectacular headland of Double Island Point & Honeymoon Bay. Lifetime experience > see Australian wildlife in their natural habitat, in the wild. Large pods of dolphins & whales (35,000 pass each way this year on migration) . Turtles, manta rays, local and migrating birds, soldier crabs in their thousands are all frequent in the Great Sandy National Park location. 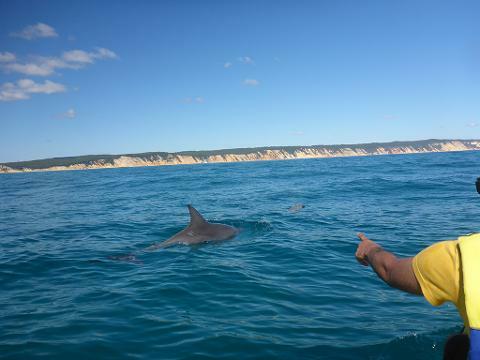 Friendly local kayak guides > learn about all the history, wildlife and conservation of the Great Sandy National Park. Beginner friendly environment suitable for all abilities. What's included: 4X4 Great Beach Drive experience, equipment, guided kayak tour, National Park entry fees, Noosa North Shore ferry fees, light snacks & refreshments, pictures on request. 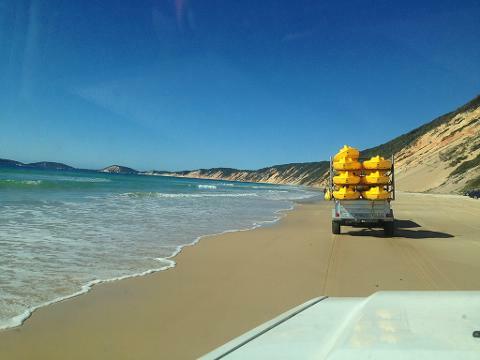 Depart Noosa in specialised 4X4 vehicles, travel via Noosa North Shore ferry and onto Teewah Beach. 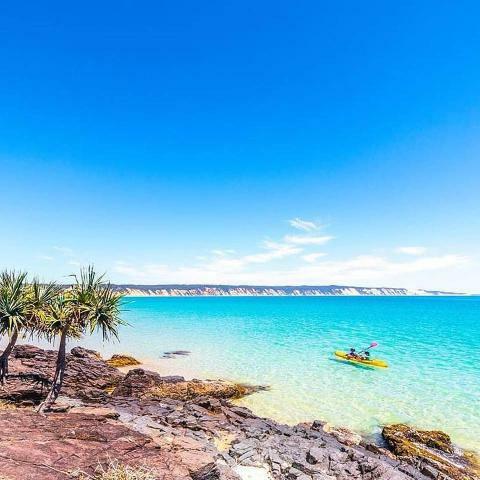 Experience the thrill of the Great Beach Drive taking in the stunning views of the Great Sandy National Park, Rainbow Beach coloured sand cliffs and stunning Honeymoon Bay. Arrive at the tropical paradise, Double Island Point. 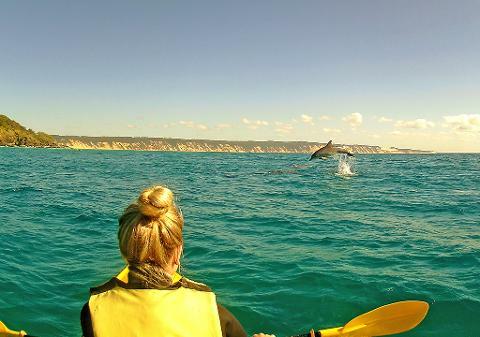 Casual guided paddle taking in the stunning natural views and local marine life. Whales on migration passing by, putting on a show or resting in the bay. Spot the different types of turtles and rays in the crystal clear waters in the protected Marine Park..
NOOSA HEADS:The J Noosa (Theatre venue) 60 Noosa Drive, Noosa Heads (excellent all day parking & best option if traveling from outside Noosa Heads). 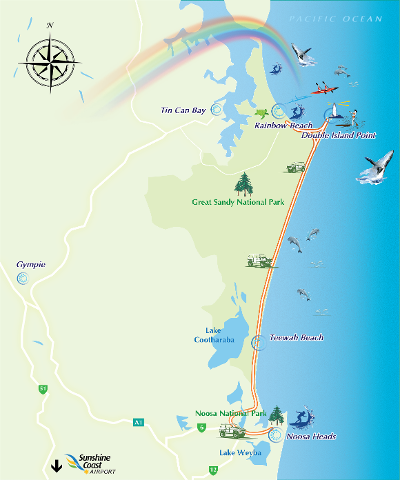 Departure times from Noosa vary daily and are set around the low tide to access Double Island Point along Teewah beach. Please contact for specific departure times. Please allow 5-6 hours from pick up to drop off.